Mr. 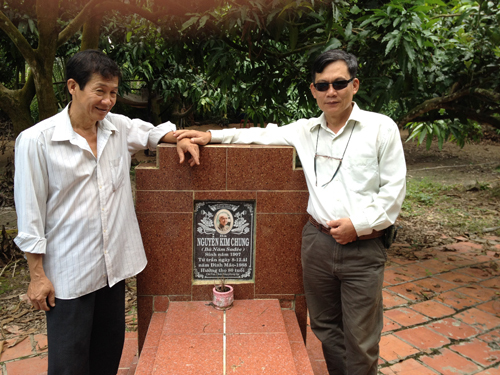 Sang (left) and poet Tran Minh Tao at the grave of Mrs. Nam Sa Dec.
Due to talent singing, the set should in 1928, Nam Sa Dec joined the delegation singing Phuoc Tuong. After that, Mrs. Nam Sa Dinh in turn collaborated with Phung Hao, Van Hao, Thanh Minh - Thanh Nga delegations ... From stage to stage singing through Cai luong, her career is very stable, just learn. Adding a bit of antiques is a great progress on the way of Cai Luong theater. During the tour, Ms. Nam Sa Dac had a lot of admirers and also had some first love. Between 1938 and 1939, one of the most salacious sentiments between Mrs. Nam and Doc Phu Su Dang Ngoc Chan (from Long An province) gave birth to a son. But for a very delicate reason, the love of the "sharp-guy" is not married couple and she Said quietly, quietly raising children and named her son Nguyen Ngoc Dang! Love broken, Ms. Nam put all the strength, the power for the arts of Cai Luong stage theater, drama ... The talent of her outstanding performance and reputation, Into the heart of the grave at that time. In 1947, Nam Sa Dac fell in love and married with scholar, archaeologist Vương Hồng Sển (formerly director of the Saigon Museum). For more than 40 years living with Wang, Ms. Wang gave birth to a son, Wang Hong Bao. Not only successful in the field of cai luong theater, she is also a woman of great cinema who are always admired by many people, (Before 1975) and many films after 1975, "Until now," "Floating season," "Disco baby," "Peaceful place singing birds ..." And in 1987, Mrs. Sa Sa played her role as Hai Lanh in the film Sa Sa. She suffered a sudden illness and died on the eighth day of the 8th year of the year of the Mao (1988). The body of the talented female artist was brought to her funeral home where she was born more than 80 years ago. Ms. Nam Sa Dec's real name is Nguyen Kim Chung. According to her grandson Thai Thanh Sang, in the late 40s of the twentieth century, when Mrs. Nam came to live with her husband, Vương Hồng Sển, due to his small, beautiful physique, Wang often called his wife "Little Miss". At that time, when Little Miss Kim Chung went to perform in the same band, there was another Little Miss (Can Tho) and they were well known in the art of Cai luong . To distinguish the two, many of the artists in the group called her "Nam Nhỏ Kim Chung" by naming her as Nam Sa Dac or Nam Sa Dec (meaning Nam Nhỏ Kim Chung from Sa Dec). Since then, Nam Sa Dac or Nam Sa Dec has been known to this day. About the so-called "Nam Sa Dac noodle soup" famous in Saigon, according to Thai Thanh Sang, with the words of the poet Tran Minh Tao (derived from her longtime friend, who is a niece The wife called Nam Sa Déc with her, she had a long time close, caring for her: then she herself and her children, grandchildren from the past no one has ever practiced buying. Sell ​​noodle or produce noodle cake anywhere. The reason why the name "Nam Sa Dec" is due to the fact that, around 1973, a third son of her young lover Nam Sa Dec (native of My Tho, Tien Giang today) opened a hawker shop in Saigon. Due to his knowledge, love of his father's old affection and affection, and his love for art, she applied for adoption. Then please get her name on the name of her noodle shop and approved by Mrs. Nam. Thanks to the processing technology of tasty and delicious, delicious, consistent with the customers of the "triple" should shop "Noodle Sa" to attract many people come together to enjoy this unique cuisine. From then on, the brand name "Nam Sa Dich noodle soup" resounded. After the liberation of the South, reunification of the Fatherland (30/4/1975), "Nam Sa Dec noodle shop" sold for a while and then changed owners. The current, The owner of the restaurant "Nam Sa Dec" (her adopted children) is settling in Sweden and still continue to sell noodle with the brand "Mrs. Nam Sa Dec" as before. In the restaurant there is a picture of Mrs. Nam Sa Dec in a place very memorable, loving and loving. Because of her love of talent, the virtue of Nam Sa Déc, she recently had a noodle shop or a noodle production plant (no relation to her) and "borrowed" her name. Make a sign for your business, production such as: "Noodle Sa", "Noodle Sa". For a lifetime of more than 80 years, she has lived and devoted herself to the arts. Speaking of the female artist, Mrs. Sa Sa, the people of Sa Dec and Dong Thap are very proud and honorable, because she contributed to the reputation of the homeland, A time to contribute energy, talent to shine dramatically for the theatrical arts, cai luong, drama and cinema of the country.